In this morning's semi-finals Pink took down Yellow and Purple emerged victorious over Orange. In the finals Pink marched out to a 4-1 lead and never looked back, winning 9-4. Congratulations Pink! 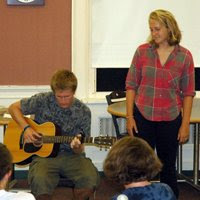 Here are five audio tracks from last night's talent show. Session C: Media Update #13 - Tourney Time! Pool Play Round 2: Red over Green 8-6, Orange over Blue 10-9, Pink over Yellow 11-2, Brown over Purple 9-8. Pool Play Round 3: Brown over Yellow 9-8, Pink over Purple 7-5, Blue over Red 8-6, Green over Orange 10-6. Orange upset Brown 10-6, Purple upset Red 7-5, Pink downed Green 9-8 and Yellow upset Blue 11-6. Three upsets! Pretty dang impressive games all around. That sets up the following semis for tomorrow morning: Orange vs. Purple and Yellow vs. Pink. 10:02am: The first round of pool play has finished with some very close games. At one point three of the four teams were tied 3-3 or 4-4. Here's how things played out: Blue over Green 10-7, Red over Orange 7-6, Purple over Yellow 9-4, and Brown over Pink 9-8. Both #4 seeds (Pink & Orange) almost managed to pull off big upsets, but both fell one short. Orange was up 6-4 before falling 7-6 and Pink was storming back but fell short at hard cap. 11:49am: The second round was off to a furious start when I left the fields. Pink had pulled out a big win over Yellow and the Purple had just taken half on Brown 6-5. Complete score updates will be posted later today. I had a nice smooth video editing run last night. 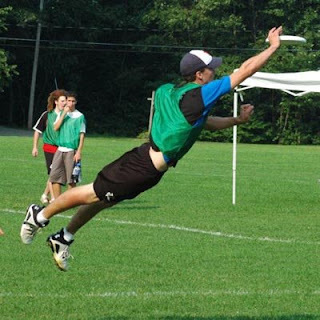 In addition to getting caught up on this session's content, I managed to go back and put together some footage from last session, as well as code up the 2006 NUTC Promo video. For the time being the videos are only online at Vimeo. I'm hoping to get them online at YouTube sometime soon. Another gorgeous evening, another fantastic trade night. Gear was swapped, haggled for, and bargained away. Nights like these make it so much harder to figure out who plays on which team. Yikes. After trade night finished I meandered around the HUGE NMH campus and took a few bonus shots. Enjoy. Another gorgeous afternoon of Ultimate has just about run its course at NUTC. We returned to the fields and went straight into the distance contest. 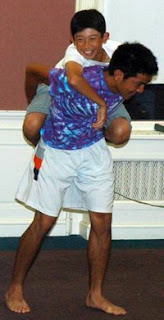 After that it was onto MTA, and then to something completely new to NUTC, a Counselors vs. Counselors game. The game was hotly contested between the Amherst vs. Non-Amherst Counselors and went to 3-3 before the Non-Amherst crew pulled off the 4-3 victory. 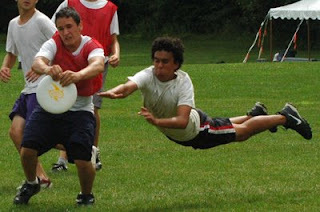 This morning's Ultimate was fast, intense, and a huge step up from earlier in the session. The morning started off with the standard warm up routines and then teams went off to warm up and run through Zone training. 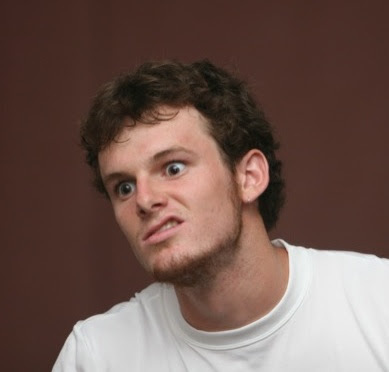 After two round of scrimmaging it was clear that tomorrow's tournament is going to be a battle. Team's showed patient Zone-O as well as brilliant fast moving continuation. The tournament schedule will be online later tonight. After a fun night of doing battle with various video compressions schemes, I settled on uploading two versions of each video. I'll now be uploading two versions of each video: Low Quality (YouTube) and High Quality (Vimeo). The YouTube videos should be quicker to load. So, if you're on a slower internet connection, go with that option. At some point I'm hoping to go back and upload a high quality version of all of the other videos. Note: I just noticed that the last four videos I uploaded aren't playing any sound. So, I need to do a bit of re-encoding and uploading. The campers put up and epic fight, scoring more points than the first two weeks, but alas, the power of the Counselors was too much for them and they fell, 21-4. Better luck next summer! Session C: Media Update #5 - Game ON! 1:27pm: The Hoard has just emerged from the woods and is lacing up for an afternoon of scrimmaging. The sun is out with no (readily apparent) threat of rain. 2:47pm: The kids have been moving through three stations: pulling, deep cuts, and defensive positioning. Three rounds of scrimmaging are set to begin in about 10 minutes. Session C: Media Update #4 - Team Night! The teams have now been set and the first big competition has come and gone. Here's what happened at last night's team night. In Mental Battleship, team Jason pulled off a dominant victory and earned a quick 4 points to build an early lead. Too bad they couldn't continue their winning ways. Bear, Ninja, Cowboy proved to be very competitive with team Dylan and Chip coming out on top. Clothes pins on the face, was, well, as entertaining as you'd think it would be. 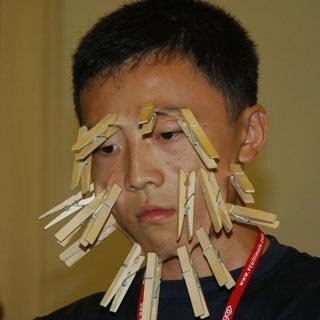 Despite some heroic effort, no one could break the camp record of 26 clothes pins on the face in 30 seconds. Keep in mind you can't put them on your ears, in your nose or mouth or on any facial hair. I thought the last rule was kind rough on us bearded folk. After all the competitors had done their thing, team Leila and Joe stood in first place with 16 pins to the face. After the rules of Shooter were set, with some heckling from the crowd thrown in, the game went quickly with team Dano and Adam taking first place. Going into the last round three teams were tied with 7 points and tension was running high. 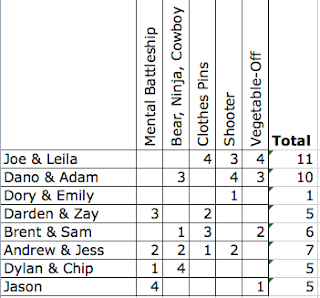 The Vegetable-Off was a spectacularly entertaining and fitting end to a glorious night of team competition. Shakespearian performances were given, as well as total space outs. In the end team Leila and Joe proved most vegitably dramatic and took home first place to earn the first pick of jersey colors. Session C: Media Update #3 - Back to playing! 9:08am: The campers are being run through dynamic stretching courtesy of Andrew. The sun is out and there is a light, cool breeze. After being prevented from scrimmaging due to weather yesterday, everyone is more than ready to begin playing. 9:18am: The campers are now grouped into their teams and being led through various drills. From where I am sitting I can see four corners, go-to, end zone, and chop-feet cutting. 10:30am: Scrimmaging has now begun. Most of the games are very close despite some early-game jitters. Many of the teams are running the split stack offense they were taught earlier in the morning. The sun is bright and so is the Ultimate. We got back to the fields at 1:30, and by 1:40 thunder and lightning had forced us back to the dorms. After a quick regrouping everyone headed over to the gym and moved through three stations: Mental Toughness, Marking, and Cutting. 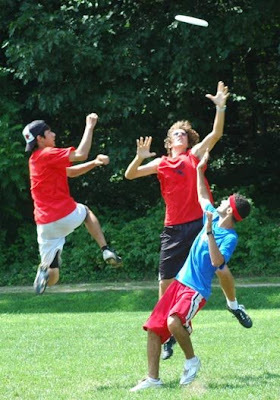 Dinner is now over and the kids are spread out playing disc golf, goaltimate, and several heated games of Pitchnut. 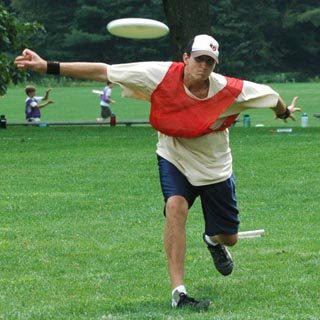 In about an hour the tournament teams will be announced making the beginning of the triple crown events: Team Night, Disc Olympics, and the Tournament. Let the games begin! Session C has started off very well. 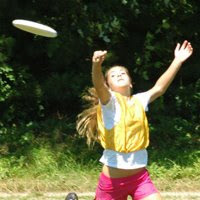 Registration day went off without a hitch with lots of quality pickup and other assorted disc games being played. Today we have enjoyed cloudy, cool weather, a welcome change from the heat of week one and the rain of week two. Note: The dorm internet connection is currently down, so my web updates may be a little delayed for the next 18-24 hours. I think that the word of the day from yesterday has to be carried over as today's word of the day as well since the rain has yet to go away. There had been so much rain over the last few days that in certain areas of the fields during the semi's and finals there was over 2 inches of standing water! In the Semi's there were show downs between Blue and Pink and Brown and Yellow. In the Brown and Yellow game, points were fought very hard and lasted for a long time. Partially induced by the weather but mainly due to the drive that the two teams had to want to win the game. In the end Yellow was able to pull out the upset and beat Brown. At the start of the Pink and Blue game the coaches of Blue (Darden and Stubbs) read a speech about wolves needing each other to survive, in order to push forward. That speech might have just been what was needed for Blue to get in the right mindset to knock Pink out of the Semi's 9-5. This game saw some of the longest points that I have ever seen. 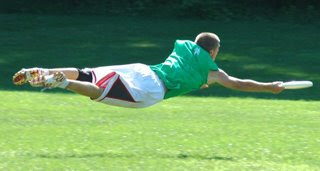 There was several layout D's, point blocks and just about everything else you'd expect to see in the finals here at NUTC. Yellow scored first and then traded off points with Blue until the score was tied 3-3. Yellow then was able to score two in a row to now make the score 5-3. Blue however remained calm were reminded to stick to their fundamentals and were able to catch up to Yellow by scoring two points. Game tied 5-5. Hard cap is now set universal game point. Every play in the tournament now comes down to this point, who will come out victorious? There were at least 3 layout d's in this point alone and in the end Blue was able to capture the win 6-5. Congratulations to the Blue Ice Wolves! Going undefeated through out the entire tournament! Again, the teams can be found here along with the scores here. You can find photos from the semi finals, finals and the awards ceremony here. People have been asking about being able to purchase photos that they have seen through out the week, so I have finally made that possible here. There are more pictures from Saturday and Sunday that were previously not posted in the other galleries. If you see a photo that you like and want a portion of the photo zoomed in and cropped chances are I can get tighter on the action/person, just send me an email using the "Contact Brian" link located in the galleries and give me the photo number and what you would like done to it and i'll email you about it. This week has been truly amazing, the level of play continued to rise as each day progressed. We battled the elements (heat and plenty of rain) and in the end we all learned a great deal of new information. I hope that everyone had a fantastic time and is looking forward to spending another week with us next year! The word of the day today is rain. From the moment we got out to the fields even till now it has been raining pretty much non-stop ranging from a light drizzle to as of right now pouring rain with thunder and lightning. Due to the rain - points were longer, easy throws now became much harder but despite the weather the campers seemed to be pumped for the days action. Orange came to play today as they went 3 and 1 (scores 9-2, 9-2, 9-5, 5-9) versus going 0-2 yesterday. Clockwork (Orange) barely missed the semi's by losing to Pink who ended up also going 3-3. Coming off of big wins against Chlorophyll (Green 9-0) and Iron Curtain (Red 9-1), Proceed With Caution (Yellow) is looking to get revenge against Brown in the Semi's. Dirty Dozen (Brown) came out very strong this morning winning all three games but in the afternoon it was a different story. The Dirty Dozen started off strong in the afternoon however there offense was not flowing as well as they would have liked which lead them to lose both of their afternoon games. Upon interviewing coach Jason he hopes that a good nights rest tonight will bring back the teams focus and help them as they move into the semi's. The team to watch tomorrow is the Ice Wolves: The Glacial Pack (Blue) they are currently undefeated and the question that is on everyone's mind is do they have what to takes to remain undefeated through out the entire tournament. Iron Curtain (Red) put up a huge effort in today's games however things just couldn't seem to click for them. It was surprising to see them go 0-5 today after being undefeated 1-0 yesterday. Another team that was surprising to watch was Chlorophyll (Green) who went 0-6 in the tournament. Chlorophyll lost twice on universe point which was heart wrenching to their team. After the tournament was done for the day. The talent show took place. There was a very wide variety of talents ranging from Leila singing "Somewhere Only We Know" with Andrew backing up on guitar to Jason Chow Science Program Presents The Evolution of Micah B-L. The talent show all contained some of the classic competitions including DanO's Haiku Challenge and the off hand drawing competition. You can find all of today's photos here. You can also find tomorrow's (Thursday) newsletter here. The scores from today's games can be found here. To see who is on what team click here. This afternoon we saw some intense action between all the teams. Team Red had a very close match between Green and was barely able to squeak a win by one point due to a strong comeback. Pink went 1-1, losing to Brown and winning over Orange. Green has a lot of height but unfortunately had a rough afternoon after they lost two players in the same point due to rolled ankles. Brown showed a lot of energy as soon as they stepped out onto the field. Brown players Adrian and Ray both had several d blocks. 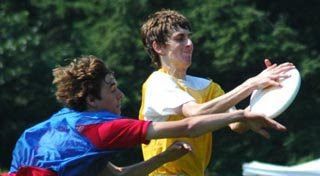 Yellow came out very strong in the second half of their first game and continued being strong into their second game. Upon speaking to coach Adam they are very optimistic about the next four games and they are looking to increase their playing ability even further. Blue team showed very good flow offense in both of their games and came out victorious being the only team ending up 2-0 at the end of the day. After the cleats had been hung up and stomachs were full trade night began. There seemed to be just as much intense action during trade night as their was during the games. The scores and standings of the tournament have been updated here. Just a quick update here. The list of players on each team has been released along with a team photo and a schedule of the tournament. The pages are being uploaded now and should be live shortly. To visit this information please click here. More updates to come tonight. 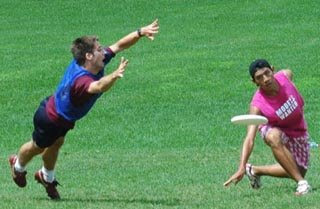 Today has been another glorious day of ultimate here at NUTC. The campers were broken up into teams last night and this morning started off with the seven teams getting their first chance to step onto the field together. The teams have been practicing very hard today in preparation for the tournament which begins tomorrow (Tuesday) afternoon. The list of teams and players will be posted around 12:30 tomorrow, team scores and photos will be updated nightly after the cleats have been hung up for the day. This way you can follow along and see your favorite teams in action. The camper vs. counselor game took place this evening with the campers scoring the first point! The second point that the campers scored was a hammer into the endzone. The campers however were unable to maintain the lead and were defeated 24 to 2. Sidenote: The game was originally planned on being played to 21 however time permitted three more points. You can view all of todays action here, there are a ton of photos (over 200) for your enjoyment! Here is a sneak peek at tomorrow's (Tuesday) newsletter. Due to an unforeseen power outage caused by a spectacular thunderstorm last night; the nightly update was unable to take place. So without further ado, here it is. You can find all the photos here which within this batch contains photos from the morning warm-ups, demos and drills, sprints, scrimmages, team meetings, and an amazing team competition for the grand prize of getting about to have the first choice of team color! Leila and Jason's team ended up taking home the grand prize with their choice of the Brown. Today's (Monday) newsletter can also be found here containing all the pertinent information to what is going on today. Sorry for the delay, I hope you enjoy! P.S. 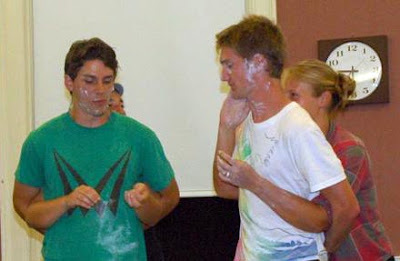 the above photo is of George Stubbs demonstrating how the sloth off event works which was just one part of the team competitions. 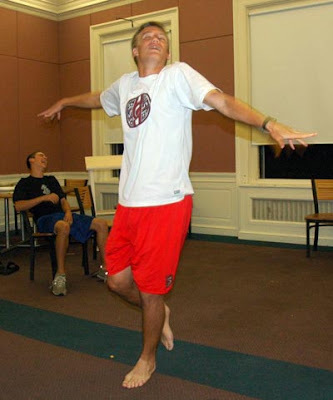 Tonight we present to you all photos from day 1 of NUTC session B 2008! You can find them online right here. Also, hot off the press is the daily newsletter Bring It In! You can find Saturday's (07-19-08) newsletter right here and Sunday's (07-20-08) right here. Don't forget to check back here nightly for more exciting updates! Here are photos from the finals and 3/4 game. In the 3/4 game Pink Eye took half 5-4 over Red Alert. Pink Eye took the first two points after half before Red Alert answered, making the game 8-6. Pink Eye then smoothly worked the disc down the field to win 9-6. After being tied at 4-4 on a 20 minute point, Rambo pulled ahead 6-4 before Pulp Flikction stormed back to tie the game at 6-6 right after the hard cap was called. On double game point Pulp Fliktion pulled and put on a strong zone that Rambo patiently worked through for a no-turn score to win 7-6. 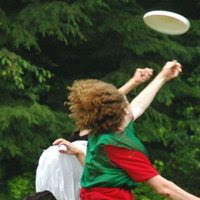 Congratulation to Rambo for winning the NUTC '08 Session A tournament! In yesterday's 5/6 game Big Wrench fended off a surging Rumble Bees to win 9-8. Here's the video from yesterday's 5 rounds of tournament play. Later today I'll be posting the talent show montage. 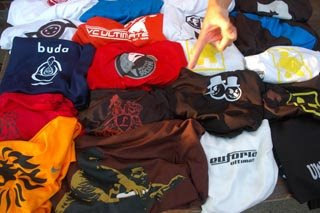 In case you're looking for even more NUTC Ultimate media, check out my podcast at www.theultiverse.com. 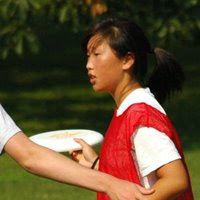 There are a couple interviews with Tiina along with a few involving NUTC counselors. I won't be able to post today's video until tomorrow. It turns out it takes quite a while to import 1.5 hours of high definition video. Anyway... here's a new media format for ya'll -- The audio of Leila singing Landslide with Andrew on the acoustic guitar. The weather is a little hotter, and so is the Ultimate. 2:28pm: The first afternoon round is underway with Pink Eye taking half over the Rumble Bees. On the other field Big Wrench is locked in a hard fought battle with Red Alert. The winners of these two games will proceed to the semis. 2:45pm: Red Alert just took half 6-5 against Big Wrench. 3:03pm: Red Alert over Big Wrench 8-5. 4:15pm: Pulp Flicktion took half 6-2 over Red Alert. Pink Eye was up 4-1 on Rambo before Rambo went on a 5-0 run to take half on a huge full layout from Stu. 4:18pm: Red Alert scores on a long huck to climb back to 6-3. Cap in 10 minutes. 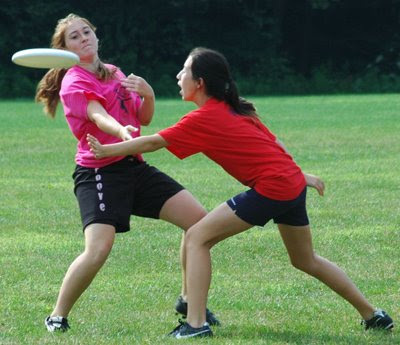 4:22pm: Pink Eye works the disc down the field, but turns it over in the red zone. Rambo pushes quickly back for the first score of the half to make it 7-4. 4:24pm: Red Alert forces a turn on a dump throw and scores on a 40 yard throw to claw back to 6-4. Pink Eye scores on a short throw to make it 7-5. 4:27pm: Pulp Ficktion forces a turn in Red Alert's red zone and capitalizes on a 15 yard down-the-line throw to score and pull ahead 8-5. Rambo scores to lead 8-5. Cap is now on. 4:30pm: Rambo and Pulp Flicktion score and both win 9-5. The finals are now set: Rambo vs. Pulp Flicktion at 9am tomorrow morning. The 3/4 game will be at 8:30 between Red Alert and Pink Eye. 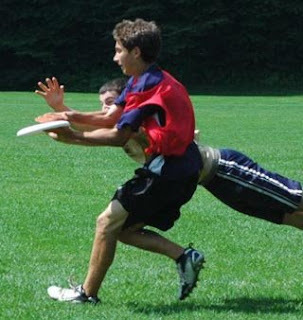 The sun is out, the air is cool, and it's time for the NUTC Session A tournament! In the first round of pool play Pulp Flicktion (Orange) powered past Red Alert (Red) 8-1. On the other field Big Wrench (Blue) came from behind to take out Rumble Bees (Yellow) 8-5. In the second round Pulp Flicktion kept up their winning ways overpowering Pink Eye (Pink), 7-3. On the other field Rambo (Green) fended off a surging Rumble Bees to win 9-5. Red Alert came out fast and took a 4-1 lead on Pink Eye to start off the third round. Pink Eye wouldn't be fazed and stormed back to tie the game 5-5 right as time ran out. Pink Eye put up a big Herold pull and strong zone. 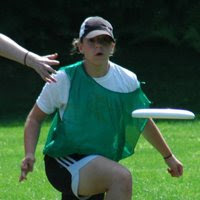 The third throw of the point was deflected by a Pink Eye defender and caught for a Callahan goal to win the game 6-5. On the second field Rambo pulled off a convincing win over Big Wrench 8-5. Many items just changed hands at trade night. In addition to all of the gear that the campers brought with them, many local players and friends showed up for the bartering melee. Coming up later tonight: The video clip of the day and footage from last night's camper counselor game. 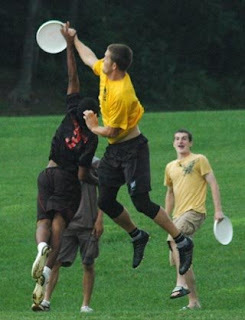 Another wonderful afternoon of Ultimate at NUTC. The weather continues to cooperate with gorgeous sunshine and a slight breeze. After regrouping at the fields, we went straight into distance throwing. Even the counselors managed to get in on the action. Next each team spent 1.5 hours working on their final preparations before tomorrow's tournament. 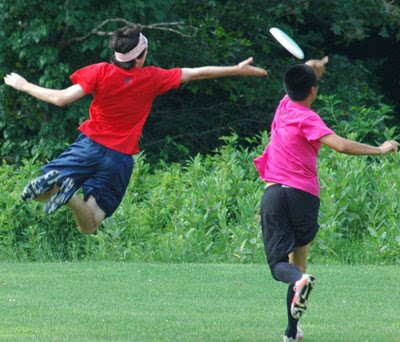 Before heading back to the dorm the campers competed in pairs MTA (Maximum Time Afloat), and now groups are heading out to see how low they can bring their disc golf scores. 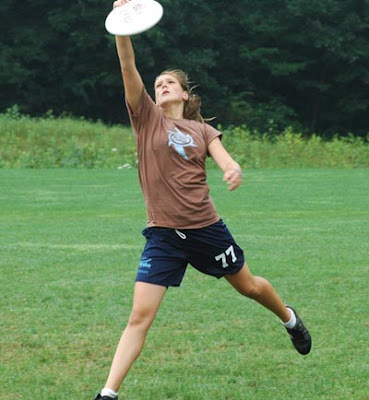 Next up in the Disc Olympics we have a mystery event, the discathon, and spinning a disc. Oh, the mayhem! Ahhh, what a perfect morning session! We woke up to a cool, slightly foggy morning and by the time we started moving around on the fields the fog had burned off and had been replaced by warm sun and a slight breeze. After running and stretching, the teams paired up and were run through zone demos. Next the teams went through two rounds of scrimmaging, working hards towards being ready for tomorrow's tournament. Next up: The afternoon session and trade night! This morning we woke up to wet, overcast weather. After a walk through the rain forest to our gorgeous fields, the rain began to pick up while everyone warmed up their throws. A couple laps and a bunch of stretching later, the rain began to dissipate as the whole camp broke into their teams. Teams then worked on various drills and prepped for their first scrimmages. By the time the scrimmages began the rain had stopped. Teams came together quickly and during their first games were running effective H-stacks and showing wonderful patience. Well.... for the most part they were :) After a round of sprinting we headed back to the dorm for lunch. 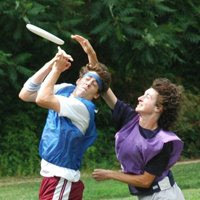 Photos from day 1 of NUTC '08 are online right here. A short collection of video clips from today is online right here. And finally, the first two issues of "BRING IT IN" are online right here (7/12) and right here (7/13).